One of my closest friends got engaged this past month *YAY* and I couldn’t be more excited. I am so very happy for her and on the other hand so very happy that I am not one of the only ones of my friends who has tied the knot. Planning a wedding is easily one of the most stressful times in a woman’s life. No, planning a wedding isn’t the hard part. It is everyone else in your life that can make it hard. If you are married, you’ll probably agree. She called to see if my husband and I would like to come over for dinner Friday. Um, yes! I had been dying to see her and give her a gift for the engagement. 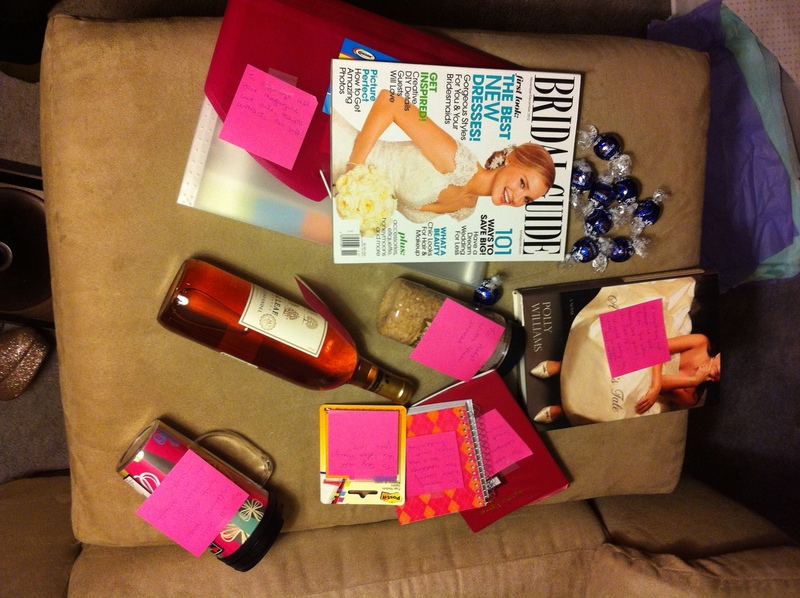 I wanted to give her a wedding planning survival kit-something I wish I had like 6 of during my whole ordeal. I looked online to get some ideas but really found only Wedding Day survival kits full of safety pins and deodorant and extra lip gloss. If I had a little more time, I would have made this kit bigger and better. Also, if Xanax was readily available, I would have added one of those as well. Here is what I had come up with. An accordion folder to organize her magazine clippings and information and contracts. I wrote a brief note on each one explaining what it was included for. The only thing I would have liked to add but didn’t get the chance to grab was a set of thank you cards. People sometimes send you cards and small gifts when they find out about the engagement. Personally, I have a huge stash of stationary so it wasn’t from experience, but I definitely would have included it! I put it all in a bag (I wish I had a box!) and taped “Wedding Planning Survival Kit” with a cross on the front. I’ll definitely be doing this for my other friends when the time comes. What else would you include? < Previous Easiest way to shred chicken-ever!